How do you win a race when you are not – on paper at least – the best athlete in the race? That would have been the situation the Great Britain team in Baku, Azerbaijan at the inaugural European Games faced during their preparations in the days prior to Sunday’s Men’s Elite race. 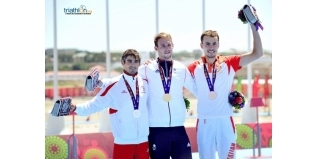 With a team consisting of Gordon Benson, Tom Bishop and Philip Graves, it would be easy to assume that this was a ‘developmental’ British squad, absent the undisputed British superstars of the sport, the Brownlee brothers, in Azerbaijan simply to gain experience for future years. However, if you don’t give it a go you’ll never know what might be achieved – and this trio produced a stunning performance of teamwork which it was an absolute honour to watch, from my privileged position as the on-site commentator at Bilgah Beach. Saturday’s women’s race was a masterclass in power and dominance from Switzerland’s Nicola Spirig – but such was that strength, the podium was all but set less than 30 minutes into the race as the Olympic Champion simply rode away from the main pack, joined with Rachel Klamer and Lisa Norden 15 seconds up the road, and that trio crushed everyone else, leaving many athletes in no doubt what they need to go away and improve if they want to compete for medals in Rio next year. In stark contrast, the men’s race was enthralling and unpredictable from start to finish, with breaks in the swim, multiple attacks on the bike, constant lead changes – and then the British team headed by Graves and Bishop – burying themselves on the second half of the bike leg to try and put Gordon Benson into position at T2 for a chance of a podium. Returning to T2 with a leading group of nine, 1min 45 secs ahead of the chasers which included the expected favourite ‘runners’ – Joao Pereira (POR), Joao Silva (POR), Fernando Alarza (ESP), Dmitry Polyanskiy (RUS) and Rostylav Pevtsov (AZE) among others – they could have done no more. The efforts of Graves were clear during the first 200m of his ‘run’ – his legs had been sacrificed on the bike course, and he would add the slowest run split to the fastest bike. He wouldn’t, and need not be concerned with that – his job had been done, it was now over to Benson to see what he had left. Would a podium, or even the win be possible for Benson? The race was finely balanced, with a significant, but not insurmountable lead given the quality of runners behind – and that the likes of the Portuguese and Spanish athletes would be very much at home in the testing conditions of the afternoon sun. The first half of the run saw the leading nine soon reduced to three, as Benson was running with Jonas Schomberg (TUR) and Andrea Salvisburg (SUI) – both of whom would have 15 second penalties to serve out on the run course for transition infringements. Would they prove critical? From the chase pack, Joao Silva (POR) and home favourite, Rostylav Pevtsov (AZE) were the athletes on the move, with surprisingly Alarza and Pereira not making any significant ground. It was going to be a question of time – Silva was flying, but would he run out of road to catch the British athlete? The gap was cut on lap one, and then starting the final lap – with Benson looking strong, but clearly having to dig very deep to maintain his pace – the flying Silva was around 50 seconds in arrears and seemingly getting faster. With 15 secs/km to gain, it was going to be close, very close, and we still didn’t know where the medals would be going with athletes having penalties to serve and being chased down from behind. Only as the finish straight and the blue carpet came in to view was it clear that Benson had managed to hold off Silva, and would cross the line as the inaugural European Games Champion. Silva (for Silver…), would cross the line 11 seconds later, and Azerbaijan were thrilled to make the podium for Bronze through Pevtsov. It was a fine win for an exhausted Benson – and indication once again that he is a big race performer, adding to his European U23 Gold and World U23 Bronze from 2014. More than anything however, it was a medal that had ‘team’ all over it – a team of athletes, supported by their Performance Director, coaches and back room staff. It’s easy to have a plan on a piece of paper and to discuss potential scenarios that might happen, but executing on that under pressure is a tough ask. Sunday’s outcome may well have been possible only once in ten attempts, but they executed on that plan under the pressure of competition, and deserve praise and recognition for delivering an unexpected and hard earned Gold medal. It was a pleasure to witness it in person.